Since breastfeeding (“Giving C some boo boos” as J likes to say) is something that I am once again doing, say, 10-15 times a day, I figured I’d share a few of the tips and resources that have helped me navigate my cumulative total of 3.5 years of boo boo feeding. 1. The “laid back” breastfeeding position. I discovered this when I visited Janaki at East Bay Lactation Associates in the midst of the breastfeeding crisis I had a few years ago with J. I was worried about my milk supply and we’d been supplementing with formula and J just seemed, in general, unwell. In the hour I spent with Janaki, her kindness, wisdom and humor sunk into my tired self like a salve. And she showed me the “laid back” position. It changed everything for J and me. I’ve been using it with C from the beginning. It magically turns breastfeeding into the relaxing break it was meant to be. Here’s me, a few days ago, all laid back in our front yard. Yes, I breastfeed in our front yard. The great thing about this position is how easy it is. You…uh…lay back. Wherever you happen to be. Couch, chair, bed. Prop yourself up with as many blankets and pillows as you need to be 100% comfortable relaxing every muscle in your body. Really. Every muscle. Janaki told me that you’ve done it right if you could fall asleep in that position. Then drape your babe across your abdomen diagonally, so that you’re belly to belly. I like to position C so he has one leg on either side of my leg, sort of horsey ride style. Then you just support the baby’s upper back, where their shoulder blades are, with your hand. When you support them like this with firm pressure, babies gain some leverage and are able to move their heads more freely to initiate the latch. (The same way that sit ups are easier when you brace your feet under the couch.) Then you sit back and relax. That’s it, folks. This somewhat upright position makes it easier for babies to feed, instead of having them in those perfectly horizontal positions that breastfeeding pillows encourage. (Would you rather guzzle down a big glass of water laying flat or propped up?) It also has the extra added benefits of giving your tired mommy arms a break, giving tired mommy a break, and making it more pleasant for your baby to breastfeed, since you’re a relaxed mommy. So throw your breastfeeding pillows out the window, ladies, cause all you need is to lean back! 2. Kelly Mom. By far the best online breastfeeding resource out there. If you have a question, they have a helpful, well-resourced article on it. Like this one that helped us navigate our first bottle feedings with both C and J. Or this one that helped me through a painful bout of mastitis that I had when J was 2. 3. If you have a partner (or a really generous friend) and a baby who will take a bottle, and you want help with night feedings to get more uninterrupted sleep, consider how your Crock-Pot could help. As a parting shot, I have to share this sketch. A year(ish) ago, I audited a birth class for my doula training and gaped over the shoulder of one of the dads in the class as he whisked his pencil ever so lightly across the page and created this gem in a couple minutes. When you’re breastfeeding, think of it like your baby is at a bar. You don’t want her to just occupy a stool at the bar, you want her to get drunk. So go forth, lay back and get ’em drunk, ladies. That crock-pot idea is terrific…..downright ingenious. That dad’s drawing is superb…..and an idea that probably only a guy would think of…very clever and to the point. Fantastic tip. And thanks so much for sharing your birth story with us yesterday. I’ve only just begun skimming some of your blog entries (more time for that next week after my last client project for a while ends), but am loving your blog. Thanks so much for sharing! Your honesty is refreshing. Of course, Beth. It was really my pleasure. Do stay connected and if you remember to, leave me a comment and let me know how your birth and post partum time is going from time to time. You may have already seen this but here goes anyway. I’m sure you would be interested in this petition…. details are lower on this page…. 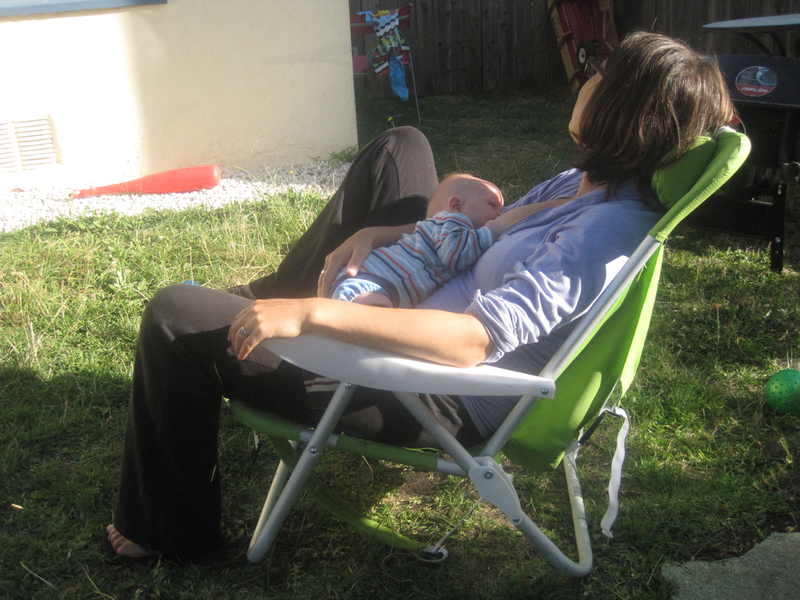 Hi there – I am a breastfeeding support worker and volunteer breastfeeding counsellor in the UK, and I would love to use the last image of you “laid back breastfeeding” in your deck chair to illustrate that it is not just something to do immediately after birth. The image would be used during training for NHS staff and also with parents that I work with as a breastfeeding counsellor. I would of course credit the image to you. Please may I have your permission? Of course, Karen. Please just credit the photo with the web address of the blog! Glad you’ll find it helpful. 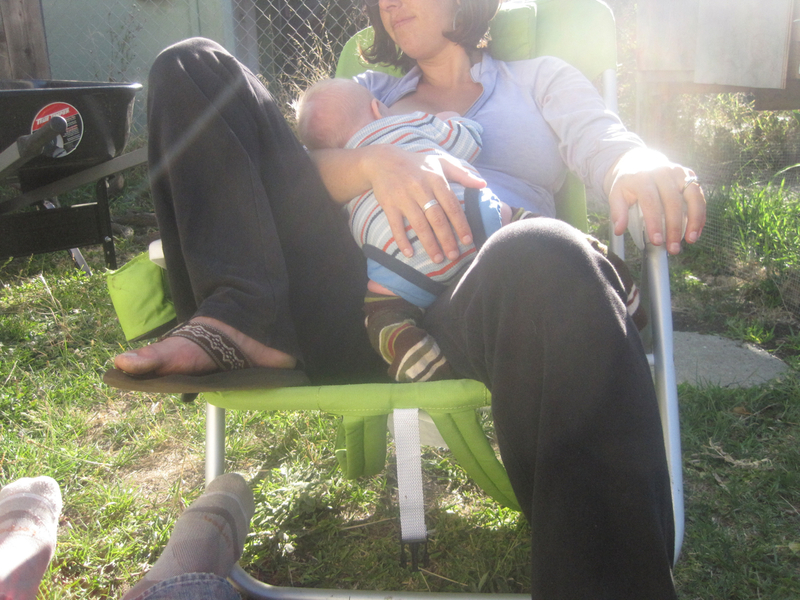 I used laid-back breastfeeding with my first son until he was 2 or 3! Hi! Your picture are wonderful. I’m preparing a diaporama to explain laidback breastfeeding to my people and I need more visual support. Do you authorize me to use your pictures (those with the green chair)? If you accept, please let me know the name of the photograph, i’ll mention it and your website. Thank you! Yes! you’re more than welcome. will email details!